TIME TO GET YOUR GAME FACE ON!!!!!!! The time is NOW to start training for camps and the 2015 season. HARD WORK DOES PAY OFF!! For more information, including times and locations, see the Camp Info page. Congratulations to a former MHS Viking, SRJC Bear Cub and Blue Chip Football Camp Camper/Coach. 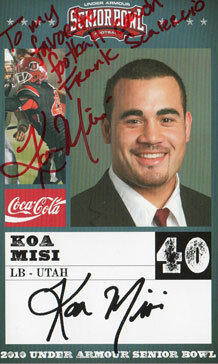 Koa Misi, 2nd round draft pick, Miami Dolphins. Have a great NFL career.